With FALCON xenon floodlights and LED light technology the companies OSRAM and A&O Technology transformed the Bavaria monument and the Ruhmeshalle pantheon into a unique light display to mark the jubilee of the festival. 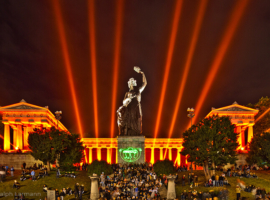 OSRAM and A&O Technology were treating the city of Munich to a spectacular light show on the occasion of the 200th anniversary of the Oktoberfest. 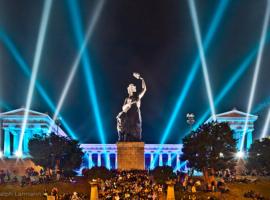 From October 1 to 4, 2010 over 8,000 LED and xenon lamps hold visitors spellbound as they light up the Bavaria monument, the Ruhmeshalle and the sky above the world’s largest fair from 8 to 11 p.m each night. 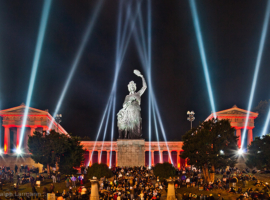 An unprecedented sight greeted the hundreds of thousands of Oktoberfest visitors on all four evenings: cutting-edge light and projection technologies “painted” the Bavaria monument and the night sky with a variety of different light motifs. Meanwhile the Ruhmeshalle was bathed in a range of different atmospheric lights. The spectacular airbound choreographed display was sure to raise many aaaaaahs and oooooohs. And no doubt one or two late-night stragglers hardly were able to believe their eyes when they step outside of the beer tent: even the base of the monument was illuminated with three different Oktoberfest logos and greetings. 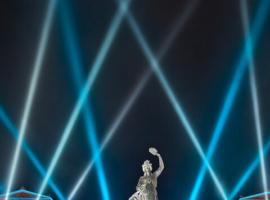 The atmospheric architectural lighting of the Ruhmeshalle pantheon and the Bavaria monument was achieved with a total of over 8,000 OSRAM Highpower LEDs. FALCON light projectors – often found at large concerts and open air festivals – were also be used. They have been fitted with OSRAM XBO 7 KW and OSRAM XStage 3 KW lamps such as the ones used in film studios. Featuring an exceptionally high luminance as well as good color rendering properties, these high-performance lamps created stunning light effects in the night sky over Munich. The whole control was carried out by a MA Lighting grandMA2 desk. 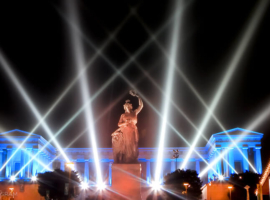 A&O Technology was responsible for the staging and the technical implementation of the light show. They were supported by the local technical partner BTL Munich. In the past, the German internationally operating company A&O Technology has equipped sport events like e.g. Super Bowl and Olympic Games with FALCON searchlights. A&O also co-operated in the realization of the permanent installations at Sony Center Berlin or Marina Bay Sands Resort Singapore, also with famous entertainment events like the millennium event in Berlin as well as the Oscar and Grammy Awards. Currently, A&O Technology supports the Rammstein-Tour with FALCON searchlights. Marco Niedermeier, CEO of A&O Technology: „The anniversary project has inspired us from the outset. It is an privilege to us to be allowed to set in stage such a historical site which is rich in tradition. The interplay between xenon light and the large amount in LED will turn the show into an impressive experience. Another positive aspect is the „green factor“ which OSRAM provides by converting the power consumption for the benefit of a long-term good cause. OSRAM was ensuring that this light display has no impact on the climate throughout its duration. The overall energy consumption, including that for transportation, installation and dismantling, has been converted into the savings which can be made by using energy-saving lamps. The rounded-up figure is equivalent to the savings made with 200 energy-saving lamps and OSRAM was henced be donating this precise number of lamps to the Münchner Tafel charity, enabling it to make annual savings of 9,600 kWh and around 4.8 metric tonnes of CO2.